Are Shake Shack's Expansion Plans a Good Idea? The company keeps opening new locations, but will that help investors? The restaurant industry is undergoing change and many brands are growing, but that has not equated to gains for investors this year. Shake Shack (NYSE:SHAK) has been no exception. The chain is quickly expanding, but foot traffic is in decline. The growth strategy may seem imprudent, but the better-burger company may not have a better choice. When looking at official spending figures for the U.S., the restaurant industry appears to be doing very well. According to the U.S. Census Bureau, total spending at restaurants and bars has increased 2.9% so far in 2017. Some of that increase has come from price hikes as menu inflation has been about 2% this year, but the other 0.5% to 1% is from Americans eating out more. However, according to industry research group TDn2K, comparable-sales and foot traffic at restaurant chains have been averaging down. Comparable sales measure a combination of foot traffic and average ticket size and have been in negative territory since early 2016. Why the disconnect between total sales and comparable sales? The problem is that the industry is opening up new locations at a faster pace than consumer demand is growing. 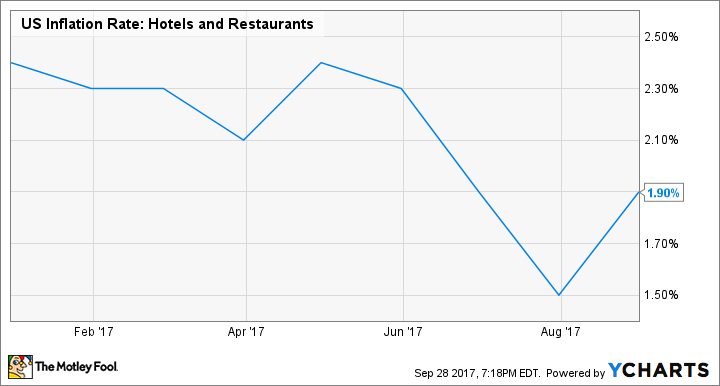 Put simply, restaurants are cannibalizing themselves. Shake Shack has been part of the problem. The company has been opening new Shacks at a fast pace since going public back in early 2015 while simultaneously enjoying higher comparable sales. At the start of that year, the company had a total of 63 domestic and international locations. That number was at 134 as of the end of the second quarter this year. However, what was once the double tailwind of new Shacks and increasing comps has turned into just one. By year's end, a total of 39 new locations will have been opened, but the industry problem of over-expansion has caught up with the burger chain. Data source: Shake Shack quarterly earnings reports. With comparable sales waning, Shake Shack's plan to keep growing may seem counter-intuitive. There are a couple reasons why the upstart burger joint may not have a choice, though. The first is that the company can still be considered a regional chain. Nearly a third of locations are in New York, and well over half are clustered along the Eastern Seaboard. With only 84 domestic Shacks, the company sees the country being able to handle over 400, but it's not going to pull that off in its hometown of NYC. A second reason is that the way Americans eat out is changing. Casual dining has been hurt the most during the restaurant recession, and some fast-food restaurants have also been feeling the pinch. Consumers are favoring higher quality and healthier food without compromising on quickness. That segment, often called fast casual, has been gobbling up market share for years. Shake Shack doesn't necessarily fall into the healthier eating category, but the better-burger chain does like to tout higher quality paired with convenience. It isn't alone, though. Other hamburger chains like The Habit (NASDAQ: HABT), Fatburger, and Five Guys are also busy expanding. Even McDonald's (NYSE: MCD) has gotten in on the better-burger action with its own lineup of pricier offerings. The combination of increased spending on eating out and the change in consumer preference is creating a race for market share. That trend toward higher quality and better ingredients has helped Shake Shack get this far, and it needs to keep growing or someone else will take the business. When Shake Shack went public a couple of years ago, investors were disappointed that store openings weren't planned at a faster pace. Today, investors are getting that faster rate of openings they wanted, but amid a more competitive landscape that will pressure foot traffic and the bottom line. Warning: Growing pains are ahead.